Over the past decade, more and more thru-hikers have ditched maps and have instead opted for guides like The A.T. Guide or Yogi’s Pacific Crest Trail Handbook that stick to the highlights – water sources, shelters, road crossings, AYCE buffets and other necessary information. They’re lighter, more compact, and easier to use. Considering the map set for Appalachian Trail contains 43 (yes, 43) maps, the logistics of figuring out when you need what maps is enough to convince even the staunchest traditionalist to ditch the topos and grab the crib notes. For many reasons, this option makes a lot of sense, but at the same time, you miss out on some of the intangible things we love about hiking. Does that mountain have a name, is that a fire lookout in the distance, what river does that creek flow into? On my 2011 AT thru-hike, I stubbornly carried the maps for a few hundred miles until the hassle became too much, and I realized I wasn’t using them enough to justify their weight. At times, I missed the ability to identify my surroundings for purely aesthetic reasons. But more importantly without a map I was far less capable of trouble shooting if (gasp) my guide failed me or the sign at a trail junction went missing or other factors forced me off my planned route. 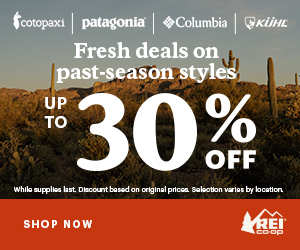 For CDT hikers, this is par for the course, but on the PCT and AT where standard practice is head down, follow the blazes, knowing how to read the landscape and understand where the trail or road is likely to be is essential to rolling with whatever punches the trail might throw at you. Every situation and every landscape is different and contains its own unique features and challenges, but here are a couple examples that can hopefully lend a guiding hand on your journey from guide-bound lackey to navigational master! 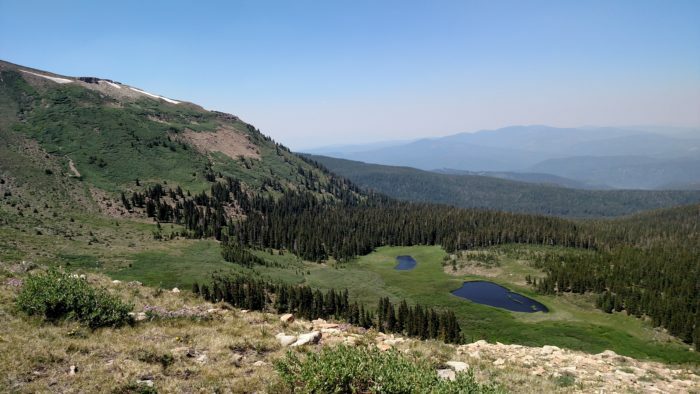 Last year, I joined a friend on his Colorado Trail thru-hike (Southbound) from Cottonwood Pass to Monarch Pass. 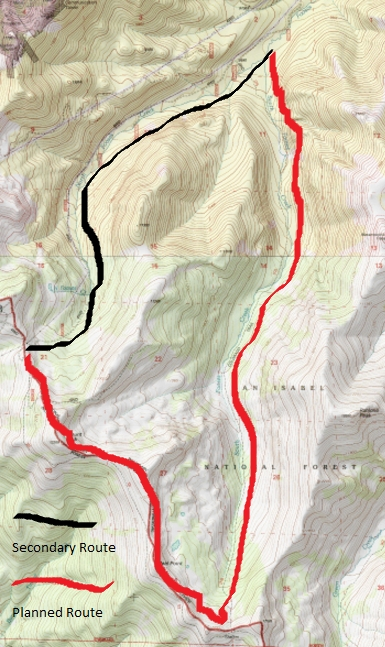 On this section, the CT has two routes – a low route and a high route that runs with the CDT. 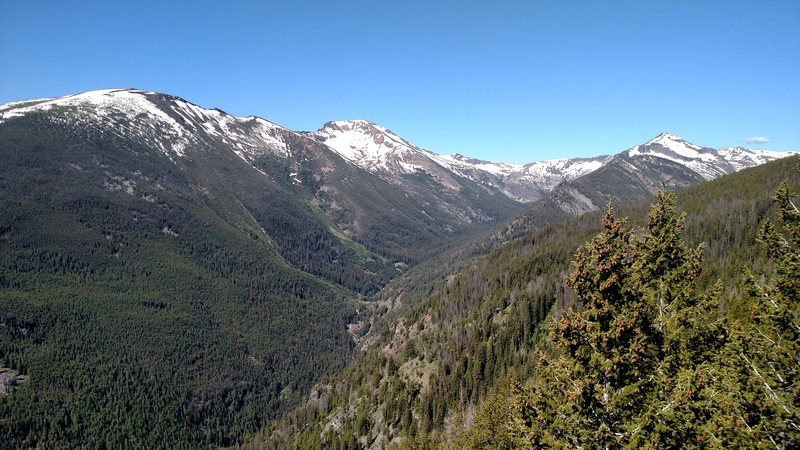 We took the CDT route, which hosts better views through the Collegiate Range, but to add a few extra miles, I parked my car where the low route crosses the road up to Monarch Pass. The plan was to continue a few miles south of Monarch Pass until the low route rejoined the CDT, then follow the low route along South Fooses Creek downhill to the road. Unfortunately, a lightning storm moved in just before I reached a couple mile section above tree line. After waiting it out for nearly an hour, the storm continued to swirl, and I was cold and ready to move. Luckily, roughly a mile before, I had passed a power line right of way that descended into a tree covered canyon that ran the same direction (north) as South Fooses Creek. After hiking back to the saddle at the top of this unknown canyon, I looked towards South Fooses Creek and saw the drainage I assumed housed the creek. From this view, I could tell that it would eventually converge with the powerline drainage if I continued down the right of way. And this is what I did, and after roughly 4 miles, I was back on the trail. While it may be obvious to some, it’s important to recognize that many trails follow creeks. I wasn’t just looking for a trail, but one that followed a creek downhill. Because I knew this, I could safely assume (which I also verified by sight) that if I followed another large drainage that ran in a similar direction, the two would eventually meet. In many ways, the PCT’s path through the Sierras can be somewhat monotonous. Climb a beautiful pass, descend to the valley bottom, climb to the next beautiful pass. Repeat. From a navigational standpoint, however, this repetition makes your job easy. Assuming the general principle from the previous example, you can almost have as much assurance of what you’ll find if you follow flowing water up as you can if you follow it down. Based on their respective geography and geology, all mountain ranges differ, but in the Sierras, you can trust that you’ll find at least one if not more lakes below each pass as the culmination of walking upstream for multiple miles. How does this help you? Well, the PCT tends to be well-marked and difficult to lose, but on the off-chance you do get turned around, you can trust that by following the water upstream, you will likely reach a lake from which you can orient yourself in relation to the nearest pass, peak or other natural feature. Similarly, let’s say you are hiking along creek and looking for a trail junction. Earlier this spring, I was hiking in the Gila Wilderness in southern New Mexico. 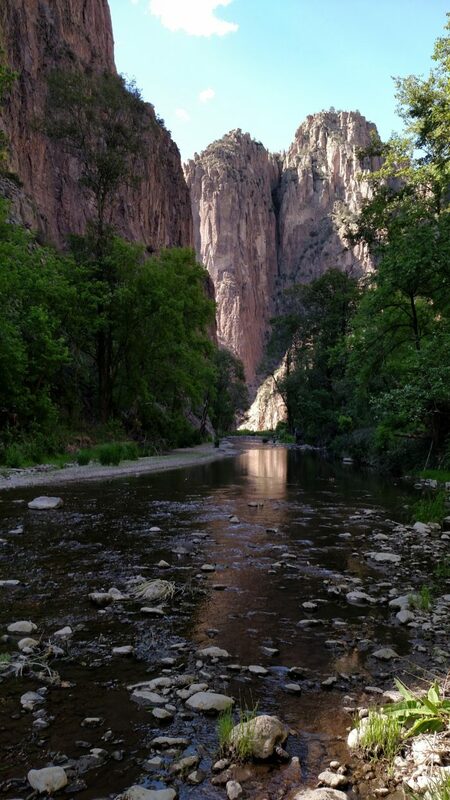 I planned to hike up the West Fork of the Gila River, climb out of the gorge and drop into the Middle Fork and hike out to their confluence. Approaching the trail junction at the end of the first day, I began to wonder if I had blown past the trail junction without noticing, as the signage in this remote area is not particularly robust. But the surrounding canyon walls were steep and I had yet to pass any place that could reasonably support a trail. Knowing this, I took a deep breath and trusted that the geography would indicate the presence of the trail junction long before I would see any sign. And sure enough, a half-hour later, the canyon widened as the mouth of a dry gulch met the West Fork and a trail wound its way up the slope – one that was far gentler than anything else I had seen for hours. In this case, knowing that the geography would denote the presence of the trail junction not only helped me navigate, but also provided peace of mind after those couple frantic moments of wondering whether the trail was behind me. While many peaks have only one way up and one way down, on the Appalachian Trail, in the White Mountains especially, peaks may see three or four trails converge on the summit, and the signage is not always as foolproof as we’d like. Mount Madison between Madison Spring Hut and Pinkham Notch is one of these places. I’m proud to say I navigated this conundrum with aplomb, but I had one friend who took a rather long detour down the wrong ridge, realizing his mistake only after wresting a map out of the hands of a confused Quebecois hiker. In a situation like this, what clues about the landscape can help you avoid a situation where you’re accosting the first hiker you pass with a map? If you only have a guidebook, one of the few things you know is that Pinkham Notch is your next major landmark, so you know you’ll be headed for the highest point in the valley below. Although you cannot see the Notch itself, you can sense the general slope of the valley below, so the ridge headed towards that high point will likely be your best bet. If for some reason you’re unable to decipher which way the river at the bottom of the valley is flowing. Look to the hillsides surrounding the valley and tributary streams flowing out of them to read which way they are flowing. Directionally, these drainages typically point in the same direction that the main river or stream is flowing, so by tracing that slope back to its highest point, you should then be able to pick your trail. Again, every situation and place presents its own challenges, but the overarching lesson is to think about the landscape and how the pieces work together. By the time you reach the Whites, you will have long since learned that ridges are high and gaps/notches are low—but why is that the case? How were these landscapes created and what elements helped carve them? How do they fit together and what might that tell you about the trail connecting the two features? As I’m sure you’ve noticed by now, water is the common theme tying together all four points. Which way is it flowing? What is the water doing and what has it done in the past? Water, in one form or another, is responsible for creating the majority of our favorite places to hike as they exist today. Some places were carved by rivers, others by receding glaciers, but almost everywhere the impact of water is present. In addition to the fact that we depend on water and enjoy its aesthetics, whether they be babbling brooks or serene alpine lakes, the paths water has carved over time did not go unnoticed by the trail builders from whose hard labor we reap the benefits. No matter where you are, if you have a map, a guide, or a GPS, nothing can replace the ability to internalize and interpret the landscape around you as you go. Use the natural landmarks. Which way are the streams are rivers flowing? If your destination is a lake, is there a visible basin with geography that suggests a standing body of water? Are you expecting a trail junction? Where is that likely to be – the confluence of two streams, a ridge top, a saddle? What around you might indicate that you’re getting close? The more skillfully you can look for and read the features of the land, the more self-sufficient you will become. Not only will you be able to guard against being caught off guard, but as you become more adept, you will become better able to interact and understand your favorite places, further elevating everything that you already love about hiking. For more information on orienteering and GPS-free navigation, check out the following resources.